More than ten years of war (1991-2002) destroyed lives, homes, families, schools, infrastructure, institutions and displaced thousands of people in Sierra Leone. Prior to the war, Sierra Leone’s economy was already crumbling and the nation was considered one of the poorest in the world. Now, well over a decade after the war’s end, Sierra Leone has held three peaceful national elections, but efforts to reconstruct, rehabilitate, and revive vital structures for sustainable economic development have been limited. A lack of educational resources, facilities, trained teachers, and the destruction of school buildings has also meant a decline in the quality of education through much of the country. Historically, Sierra Leone’s British educational system has produced a large number of elites who either lack practical skills or are detached from realities of their communities. This therefore makes it impossible to effect meaningful programs that lead to community development. Project1808 was formed against this backdrop in 2009 to address the quality of education as a tool for sustainable community development. Its formation came out of the personal efforts of Alhaji N’jai (a survivor of Sierra Leone’s brutal war) to support family and friends back home while he was pursuing post-doctoral research at the University of Wisconsin-Madison. Since its creation, Project1808 has already had produced a noticeable and significant impact in the community in a relatively short amount of time with very little funds. Powered primarily by private donations and a spirit of hopeful volunteerism, Project1808 received 501(c)(3) non-profit status in the United States in 2011, and now provides financial support to 64 students in 7 schools: 3 primary schools, 3 secondary schools and The School of the Blind. We also provide local opportunities for service learning, as well as after-school tutoring and mentoring programs designed not just to improve students’ performance on various national exams but to facilitate meaningful knowledge application in their communities. Map of Freetown from a 1794 Sierra Leone Company report. The name Project1808 harkens back to the year 1808, a year in which the slave trade was abolished in the British Empire and slaves were prohibited by law from being imported into the United States. 1808 was also the year in which Freetown, (Sierra Leone’s capital city) became a province of freedom and repatriation, the city where freed slaves from all over the world could resume a life of dignity and develop a voice for their own future. 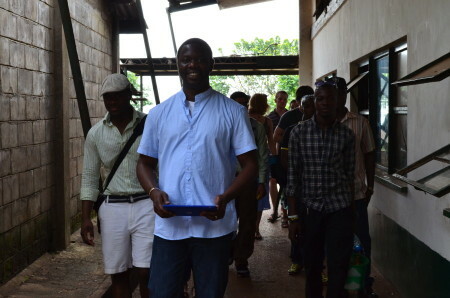 As Africans from all over the world came to Sierra Leone, the country quickly became a center for optimism, capacity building, progressiveness, creativity, innovation, and unbridled imagination that was fueled by the constant flow of knowledge gathered from throughout the global diaspora and streaming outward across all ages, cultures, backgrounds, and functions. Indigenous knowledge systems in iron, gold, agriculture, fishing, and trade had been developed in the early centuries and practiced by various ethnic groups long before western contacts. Along these lines, Sierra Leone also served as the educational centre of British West Africa with the first primary and secondary schools in the region, and became known as “The Athens of West Africa,” largely due to the spirit of partnership, innovation, and leadership put forward by great minds in the early years of 19th century. Fourah Bay College, established in 1827, rapidly became a magnet for English-speaking Africans on the West Coast and functioned as the only European-style University in western Sub-Saharan Africa for more than century, educating and training several generations of African leaders. The period inaugurated in 1808 was one of great optimism, one which promised recognition of the worth of our human resources, aware that building better, more capable people was the key to building better lives. It was this spirit of partnership, innovation, imagination, and leadership that gave rise to great African minds such as Davison Nicol, Africanus Horton, Edward Blyden, Bai Bureh, Nelson Mandela, Madam Yoko, Nkwame Nkrumah, and Thomas Sankara, among many others. Project1808 seeks to borrow from this heritage, renewing or reviving the spirit of optimism, progress, hope, and innovativeness that existed among natives and returned freed slaves to Sierra Leone in the early 1800s through independence in the 1960s. The people of Sierra Leone have proven themselves to be among the worlds’ most resilient from independence through 10 years of war and devastation. Project1808 symbolizes an effort to empower a communities and provide the means and a medium to channel that resiliency into building sustainable solutions in the Sierra Leonean communities. We believe that fighting poverty and maintaining stability in Sierra Leone requires small, pointed, and targeted approaches that focus on improving educational quality and utility, enabling indigenous skills and training, and promoting an environment of self-sustainability. We have made tremendous progress in this direction. Despite these accomplishments, we need your help to achieve our goal of self-sustainability.